Sunny, but chilly day here on the Adriatic of the coast of Lido. It snowed in the mountains just North of here Tuesday night and the white hills are a beautiful backdrop to the racing here. 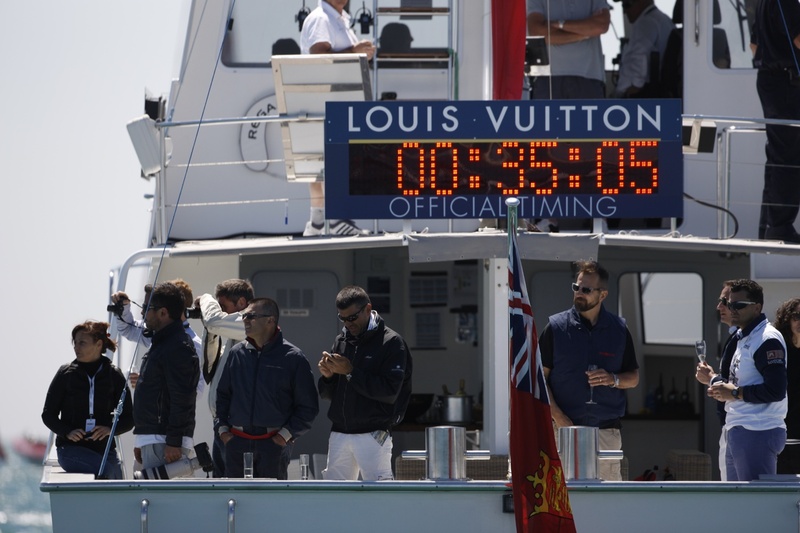 Over 100 spectator boats ringed the race track to watch the fleet of nine do battle in the 8-12 knot breeze. On a personal note has been a lot of fun for me to return to Venezia where I lived and worked in 1990 while preparing the Il Moro di Venezia Challenge. Venezia is a jewel of a city....maybe there is none more unique in the world. The city certainly has turned it on for this America's Cup event! Two fleet races were held to seed the fleet for Match Racing. Artemis had a very good first race finishing second to Team Korea but a tough second race finishing 7th. The fleet is very competitive, so nothing is easy out there. Artemis was up against Emirates Team New Zealand for a two out of three quarter match race series. In the first race, after a dial up by Emirates Team New Zealand, our boys did a lap around the committee boat to shake the Kiwis. Both boats were over early, but we managed to lead at the first mark and stretch from there to win by a large margin. 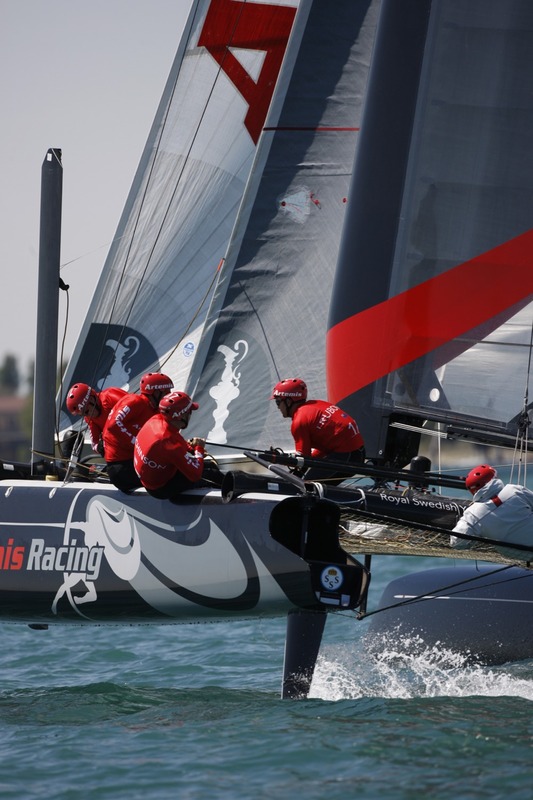 The 2nd race was close at the start, but we rolled the Kiwis again and that was about it for a 2-0 win for Artemis Racing. 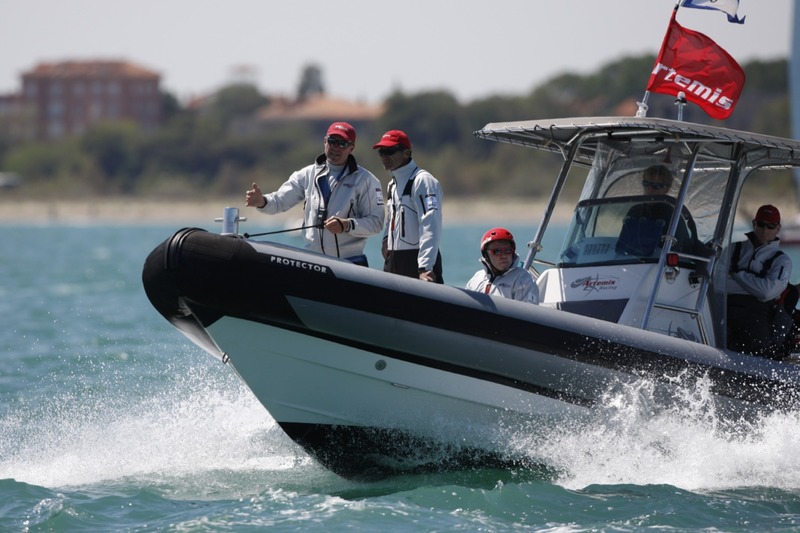 The Artemis boys looked sharp on the boat handling and quite fast as well. Lots of hard work by the whole team went into that. Very nice to see. Tomorrow will start out with two Fleet Races then the Match Race semi finals which will see Artemis pitted against Team Energy of France.